The grand leader of the Oodua Peopleâ€™s Congress (OPC), a Yoruba nationalist organisation, Dr. Frederick Fasehun, has decried the current state of the country, saying the whole world is disappointed in Nigeria. 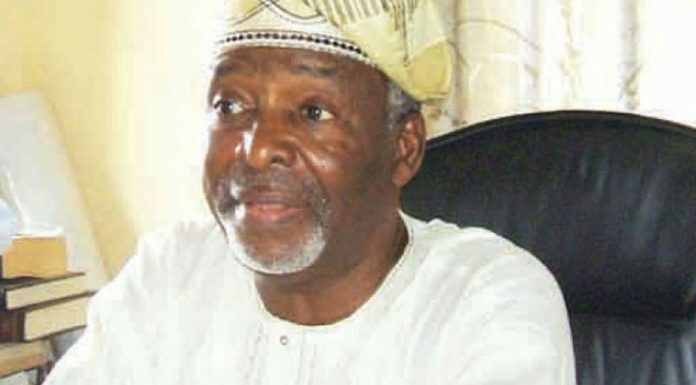 Fasehun stated this thursday in Lagos in an interview with journalists on the sidelines of the youth conference organised by the Frederick Isiotan Fasehun Foundation (FIFF) which was held to sensitise the youths on the 2019 elections. The elder statesman, who painted a gloomy picture of the steady fall in all indices of the countryâ€™s development, pointed out that the situation had led to Nigerians fleeing the country in search of better life. Fasehun also added his voice in the call for restructuring of the country, warning that failure to do so, the country would not get out of its current socio-economic quagmire. According to him, â€œSo far, the whole world is disappointed in Nigeria. They are embarrassed by the situation of this country. Nigeria which used to be a great country has now failed in all ramifications. The OPC leader, who earlier addressed the youths numbering over 1,000, charged them to try and get their Permanent Voterâ€™s Cards (PVCs) and be ready to take power from the present â€œincompetent governmentâ€ in the 2019 general election. He said Nigerians residing in the country are suffering and dying because of poor leadership, adding that those who could not withstand the harsh situation are migrating to America, Canada and Israel. He argued that this was because those countries had gone through changes effected by their leaders. However, the retired medical doctor joined Nigerians in the call for restructuring of the country. This, he explained, holds the key to the progress and development of the country. The Yoruba leader explained: â€œThatâ€™s one of our problems. If Nigeria does not restructure, we will not get out of this mess. Why canâ€™t I see what is available in my backyard; explore what is available, sell, export and pay tax to the government. But the constitution must give me an opportunity to explore what I have in my backyard. â€œAnd why should I sell what is in my backyard and share the profit with you? Thatâ€™s why restructuring is necessary. If there is no restructuring, forget the progress of Nigeria.